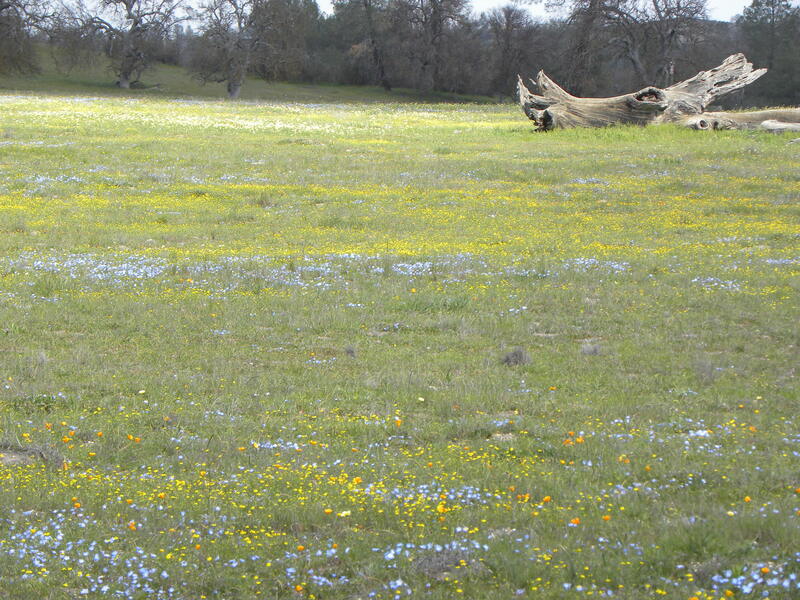 One of the outstanding spring wildflower destinations in California. Meet at the Santa Margarita Exit Park and Ride at 8:30 am. Bring plant guides or plan to purchase one during the trip. Also bring adequate water, food, and dress in layers for the weather; a hat and sturdy shoes are advised. Join us to explore and appreciate the remarkable and unique display of annual and perennial spring wildﬂowers in eastern San Luis Obispo County. This could be the BIG YEAR in this giant swath of undisturbed California Prairie. Remember, this is a remote area, so make sure you have plenty of gas, water, as well as food. Meet at the Santa Margarita park-and-ride (freeway exit, State Route 58 at Hwy 101) at 8:00 am. We will caravan from there with a brief stop at Shell Creek. You may be able to carpool with someone, so it is recommended to arrange your ride ahead of time, or jump in with others at the meeting place. Be sure to wear sturdy shoes, bring sunscreen, a hat, and layered clothing for warmth, as needed. For more information contact: George Butterworth, (805) 438-3641, gbutterworth8@gmail.com or Bill Waycott, (805) 459-2103, bill.waycott@gmail.com. Rain cancels. Saturday, April 2, 2016, Malcolm McLeod Annual Field Trip Meeting to Shell Creek co-lead by Dirk Walters and David Chipping. This is our monthly meeting for April. Meet at the San Luis Obispo Veterans Hall, 801 Grand Avenue (corner of Grand & Monterey Boulevard) at 8:30 a.m. and/or the Santa Margarita Park & Ride (intersection of Hwys. 101 and 58) at 9:00 a.m. Bring your “Wildflowers of Highway 58” plant guide by Dr. Malcolm McLeod or plan to purchase one for 10 on the trip. For more information call Dirk Walters at 543-7051 or Dave Chipping at 528-0914. Saturday, 4th April, 2015, Malcolm McLeod Annual Field Trip Meeting at Shell Creek. Join us to explore and appreciate the remarkable and unique display of annual and perennial spring wildflowers in eastern San Luis Obispo County. Meet at the Santa Margarita park-and-ride (freeway exit, State Route 58 at Hwy 101) at 8:00 am. We will caravan from there. You may be able to carpool with someone. It is recommended to arrange your ride ahead of time. Be sure to bring water, food, sturdy shoes, sunscreen, a hat, and layered clothing for warmth, if needed. For more information call: Bill Waycott, (805) 459-2103, bill.waycott@gmail.com. Dr. Malcolm McLeod was a professor of botany in the Biology Department at Cal Poly from 1979 until his full retirement in 1993 and an active member of the San Luis Obispo Chapter of the California Native Plant Society (SLOCNPS) from 1973 until he died in 2006. Dr. McLeod was a charismatic and inspirational chapter leader that served tirelessly on numerous committees and held several offices including president, recording secretary, and rare plant botanist. He was an educator, rare plant advocate, pioneer of native horticulture, photographer, author, and scientist with an uncanny ability to recognize species long believed to have been extirpated. In 2004 his vast contributions were recognized when he became a CNPS Fellow, the highest honor awarded by the Society. As part of Dr. McLeod’s continued memorial, SLOCNPS created the Malcolm McLeod Scholarship fund that is intended to encourage the study of botany by providing financial support to outstanding students in our region. Interested students are required to submit a brief letter that describes their research and how it relates to the overall mission of CNPS, a letter of recommendation, a timeline, and a budget that outlines how the funds will be spent. Awards typically range from 100 to 500 dollars. Award recipients give a presentation about their research at a local chapter meeting. Since its inception, the McLeod Scholarship has been awarded to several local botany students. Jenn Yost received the award in 2008 for her research on local adaptation and speciation in goldfields (Lasthenia spp.) and members of the genus Dudleya. Ms. Yost has since gone on to pursue her Ph.D. at the University of California, Santa Cruz. Carlos Torres was awarded a McLeod Scholarship in 2010 to conduct an out-planting study in the Guadalupe-Nipomo Dunes ecosystem with two of our County’s most imperiled species, Gambel’s watercress (Nasturtium gambelii) and marsh sandwort (Arenaria paludicola). Carlos has gone on to become the restoration coordinator for the local land conservancy. Kristie Haydu, who was recently elected recording secretary for the chapter, received a McLeod award in 2011 to identify and map plant biodiversity hotspots in San Luis Obispo County with geographic information system (GIS) that can be used to establish long-term conservation strategies and influence planning decisions. Taylor Crow was awarded a scholarship in 2013. He was a second year master’s student at Cal Poly, graduating under the direction of Matt Ritter. Taylor spent his graduate career working on Swanton Ranch because of the wonderful amount of plants and surf breaks. He got his start as a botanist in David Keil’s and Dirk Walter’s plant taxonomy class. Taylor spoke at our chapter meeting in June, 2013. In 2014, the McLeod Scholarship was awarded to Natalie Rossington to study the distribution and ecology of native populations of Layia jonesii and Layia platyglossa in Reservoir Canyon. Graduate and undergraduate botany students from Cal Poly, Cuesta College, and Allan Hancock College are eligible to apply. SLO-CNPS would like to see the McLeod Scholarship fund continue to grow. Growth of this fund will provide more substantial awards to a larger number of students. Education is expensive and as costs continue to rise, scholarships of this nature are increasingly important for students pursuing higher education. In addition, student research can furnish CNPS with valuable data to inform plant conservation issues and policy. Students are ultimately the next generation of CNPS and they will continue our mission well into the future. Over the last few years we have received several donations to the Scholarship fund in memory of Dr. McLeod. Please consider making a year-end and tax deductible donation or bequest to the Malcolm McLeod Scholarship fund. For more information regarding donations please contact Linda Chipping. Description: Malcolm McLeod Annual Field Trip Meeting to Shell Creek co-lead by Dirk Walters and David Chipping. This will be our monthly meeting for April. Meet: SLO Vets Hall, 801 Grand Ave. (corner of Grand & Monterey Blvd) at 8:30 a.m. and/or Santa Margarita at 9:00 a.m.
Bring your “Wildflowers of Highway 58” plant guide by Dr. Malcolm McLeod or plan to purchase one for $10 on the trip. 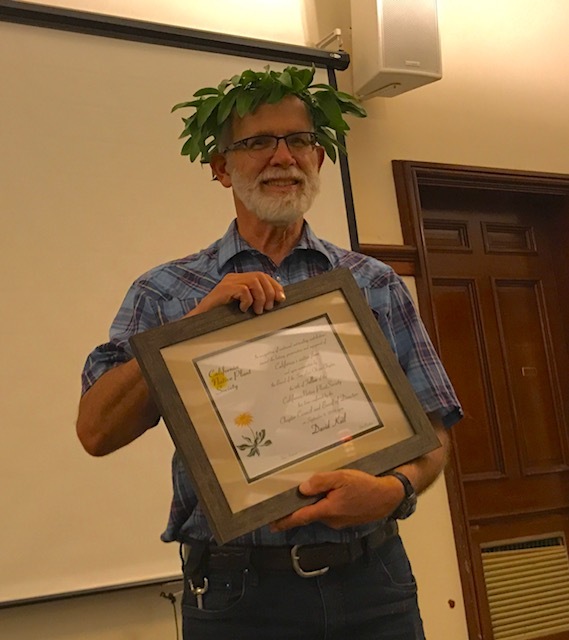 Acting on the nomination submitted by our chapter, the State Board recognized Dr. David Keil as a Fellow of the California Native Plant Society at its September meeting. He has been an active CNPS member; was a Cal Poly botany professor for over 37 years; and, through research and writing, has made significant contributions to California’s native flora. Dave earned his B.S. in 1968 and M.S. in 1970 from Arizona State University in Tempe, and his Ph.D. from Ohio State University. Dave joined Cal Poly faculty in 1976, and two years later was appointed Director of the Robert F. Hoover Herbarium. His collection totals over 30,000 specimens, most of them housed at the Hoover Herbarium. He joined CNPS shortly after his arrival, and in 1978, served as the Chapter President. In earlier recognition of his generous contributions to our chapter, Dave was the recipient of the 1989 Hoover Award. He has led numerous chapter field trips for the San Luis Obispo chapter, some planned with detailed plant lists, some spur of the moment. Dr. Keil has also presented chapter meeting programs and workshops on a regular basis. His broad knowledge of the county flora allowed him to surprise those attending with new discoveries, unusual findings, as well as his great slides. For anyone not familiar with county flora, Dave would answer any question. His small workshops conducted before chapter meetings include oak identification, plant collecting, rare plant training and a new grass identification key. In 2009 Dave’s participation on a ‘quick’ CNPS committee to develop a one page tri-fold of common plants for distribution by the City of San Luis Obispo became the 86 page Wildflowers of San Luis Obispo, California. It was an enormous success. As this nomination is being written, he is doing the proof reading on the revised second edition. After Dave’s retirement from teaching at Cal Poly, he was recruited to serve as chapter Vice President and has done so since 2016. He has always been a chapter resource. At the state level he participated on the Rare Plant Scientific Advisory Committee from 1998 through 2001. Since 2009, he has served as a member of the Fremontia Editorial Advisory Board. From 2014 through 2016, Dave reviewed student grant applications with the Education Program Grants Subcommittee. On an annual basis since 2009, Dave has conducted multi-day plant science workshops on California flora for the State Education Program. For the workshop held in April 2018, Dave watched the county landscapes closely, knowing that the drought was adversely impacting the flora, but he was confident the workshop would be successful, and it was. In the world of service to botanic science, he had made significant contribution to The Jepson Manual Project. He authored the Key to California Plant Families and served as the editor and primary author of the Asteraceae for both editions of The Jepson Manual. Key writing has always been one of Dave’s strengths, and it is a major part of the long-lasting legacy he has created throughout his career. For the second edition of The Jepson Manual, Dave authored a new key to families that encompasses the major taxonomic revisions that had taken place since 1993 and served as co-editor for the entire manual. His ability to track nomenclatural changes and translate them into meaningful morphological characters in all the major plant families was crucial for the writing of the new family key. Part of what makes Dave’s keys so valuable is that they are written with field botanists in mind, anticipating user misinterpretation on minor characters. This can only be done if the key writer is familiar with every other possible plant, which Dave usually is. Dave has authored over 130 species descriptions mostly in the Asteraceae, but also in the Poaceae and Ranunculaceae. Four taxa have been named in Dave’s honor: Ancistrocarphus keilii Morefield, Erigeron inornatus (A. Gray) A. Gray var. keilii G.L. Nesom, Wedelia keilii B.L. Turner, and Chrysanthellum keilii B.L. Turner. Dr. Keil joins chapter members Dr. Dirk Walters and Dr. David Chipping as Fellows of CNPS. Past Fellows from the chapter include Dr. Malcolm McLeod and Alice and Bud Meyer. This delightful guide to the plants of the sand dunes is geared to the layperson. 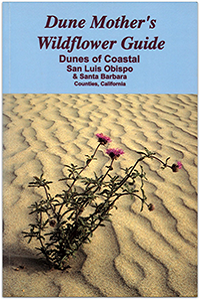 Although the book is written for southern San Luis Obispo and northern Santa Barbara Counties’ coastal dunes, it should also prove useful in other California Coastal areas, as many of the species are widespread. Over 150 color photographs of more than 120 plants. Plants are arranged according to the areas of the dunes (shoreline, fore dunes, stabilized and unstabilized dunes) in which they would most likely be found. 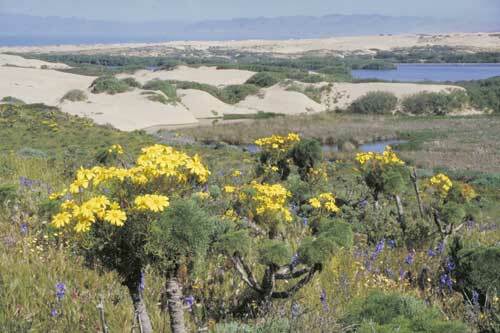 The Dune Mother is a reference to Kathleen Goddard Jones, a well known local activist who worked tirelessly for many years to help protect the dunes and their vegetation. Our Chapter would like to thank the anonymous donors of $1,000 to the Malcolm McLeod Scholarship Fund. This fund supports student research and has aided many students in projects that have contributed greatly to our knowledge of the flora. If you would also like to help students in their research, please look at our web page on the fund.